For a Viking warrior death was nothing to be feared, and should a warrior have lived a true and honourable life his burial would reflect his success. You see in old Norse times to die in battle, being brave and strong was a true honour. Your comrades and friends would be proud of you, and you would have gained entry to Valhalla, the Norse stronghold in Odin’s realm that only accepted true Viking warriors. So with the constraint of fear removed, Viking warriors were capable of true freedom in battle, the fear of death was absent for them. Should they die on the battlefield, they know that their death would only lead them to Valhalla or even Folkvangr should they be chosen by the Goddess Freya. Either way was preferable to Helheim a place for the weak to visit in their afterlife. Due in part to their pagan religion and its belief system, the Vikings and the Norse people were likely not as concerned about death as their Christian counterparts. The Norse gods smiled favorably on the brave and violent, to die in battle was just about the highest honour for a Viking warrior and therefore death was not to be feared. Were a Viking to fall in battle and the gods were to favour him, then his journey would be just beginning. The afterlife was waiting for all the brave Viking warriors and with this belief, these ancient fighters were free in battle. 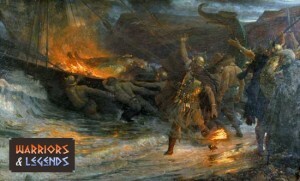 A Viking warrior being burned and send out to sea in a ship, an extravagant burial for a famed Viking. Many stories and graves exist for the old Norse people, and the common image of a Viking burial as a flaming ship carrying a warrior out to the ocean is often not completely in line with reality. 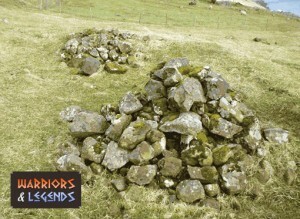 More typical for many Viking warriors was a burial in land, either in the ground or under a pile of rocks. Typically the Vikings used two methods of funeral cremation or inhumation, where cremation involved burying the bodies on a funeral pyre, and inhumation involves burying the body in the ground as it is. Of course for wealthy or noble Viking warriors an extravagant burning ship burial could have happened. This would be a suitably grand way of sending off a suitably grand Viking warrior. After death the Vikings believed in their afterlife, which existed in the realms of Norse mythology. A fearless warrior who died in battle would be blessed by the Norse gods, ending their days in the realms of Valhalla or Folkvangr, both of which we will explore in more detail. Valhalla is the home for brave warriors to go after their mortal life. Valhalla is a hall in Odin’s realm where the ale flows freely and warriors can feast on roasted boar till their stomachs are full. A Viking warrior grave, typical of the style of burials the Viking practiced. The Norse legends tell that fallen Viking warriors will go to Valhalla until the Doomsday, known as Ragnarok in old Norse times, where the warriors will battle alongside Odin against the Norse giants. While most fallen Vikings would go to Valhalla, there was also another possibility for them in Folkvangr. Folkvangr was a realm ruled by the goddess Freya, and lore has it that Freya would pick certain fallen warriors to come and stay in Folkvangr rather than Valhalla. Folkvangr is often described as beautiful field or meadow, located in Asgard where weary fallen warriors can rest and relax in their afterlife. By its very nature death for a Viking was little more than a step on the next journey. Were they to die in battle with honour then Valhalla or Folkvangr would await them, ensuring they could fight with valour on the battlefield, unworried as to their fate. In death and burial, the most grand funerals were wholly reserved for the very important Viking warriors. But regardless of the stature of the burial, should a Viking give his all in combat he could assured of his place is Asgard to some degree.